Bulls coach Tom Thibodeau is known for his serious nature, intense preparation, and consistent drive to make his team better. His focus is solely on basketball and he rarely strays off topic into anything remotely personal. But a good friend of his, first-year Bobcats coach Steve Clifford, was happy to share a few tidbits on how Thibodeau has impacted his career prior to Monday’s game. “He’s worked extremely hard to get this opportunity and I think he’s well prepared for it,” said Thibodeau of Clifford. Clifford went on to recall a visit in September when he flew to Chicago and spent the day with Thibodeau. Following in Thibodeau’s footsteps would be a remarkable accomplishment for Clifford, whom Bobcats majority owner Michael Jordan hired to replace Mike Dunlap after just one season. Clifford applauded Chicago’s well-rounded attack, one that he’d like to implement in Charlotte. Thibodeau routinely is credited for his team’s defense success—since his arrival in 2011, the Bulls have ranked no longer than 3rd in the NBA in scoring defense—but Clifford insists he knows what he’s doing on the offensive end as well. Thibodeau was also complementary of Clifford when asked about his counterpart. Like Thibodeau, it took Clifford many seasons to acquire a head coaching job. 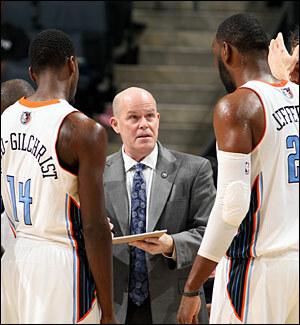 In Clifford’s case, he brought 28 years of coaching experience at the NBA and collegiate level to Charlotte, including spending the previous 13 seasons as an assistant coach for the New York Knicks, Houston Rockets, Orlando Magic and Los Angeles Lakers. But Thibodeau didn’t want to make too many comparisons. Speaking of coaches looking for that opportunity, Bobcats associate head coach and Hall of Famer Patrick Ewing hopes he will someday land a top job. Thibodeau was an assistant coach for the Knicks from 1996 to 2003, and he’s a believer that the time for Ewing, who entered the NBA as a rookie in 1985 and spent 15 of his 17 professional seasons in New York, will come. Thibodeau sees Ewing’s experiences with Doug Collins, Jeff Van Gundy and Stan Van Gundy–whether he played for them or coached with them–as factors that will be on his side. “When the opportunity comes, I think he’s going to do a great job,” said Thibodeau. Ewing, who has served as an assistant coach the Washington Wizards (2002-03), Houston Rockets (2003-06) and Orlando Magic (2007-12), isn’t surprised at all about how well Thibodeau has done with his first head coaching job. “I knew he was good but nobody knew how good he was going to be,” said Ewing of Thibodeau. “He’s done an outstanding job and I’m very happy for him.